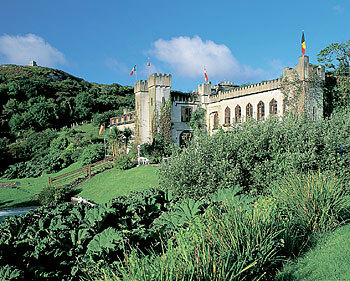 Castles abound all over the countryside of Ireland, but they’re not just for royalty anymore. Many travelers who dream about Ireland imagine rolling green fields with majestic stone castles rising into the blue sky. But an Irish castle doesn’t have to be only a part of the scenery. A smattering of castles all over Ireland offer a wide variety of accommodations and features to adventurous travelers who want to experience a touch of castle life first hand. From luxury accommodations to medieval banquets and resident ghosts, Irish castles offer striking views of the countryside, and traditional sightseeing opportunities are always nearby. John Colclough, a travel specialist at Adams & Butler in Dublin, works with travelers to book castle accommodations. "There is pretty much everything that you could want…from the point of view of price, from the point of view of location, "Colclough says. "You can have them on the seaside, you can have them in the middle of the mountains." You can even rent out an entire castle if you want to, and the price isn’t as prohibitive as you might expect. Colclough says that there are small castles of about three bedrooms that can be rented out for as little as $1,600 a week. In County Clare, the five-bedroom medieval structure called Knappogue Castle can be booked for around $6,825 a week. Knappogue Castle is only a short drive from Shannon Airport, and stages a nightly medieval banquet with storytelling and medieval music. Of course, for those with more flexible budgets, there are other sorts of arrangements available. For $99,000 a week, you can feel right at home in the 16 bedrooms and 14 bathrooms of Humewood Castle in County Wicklow. With its gray spires rising from the Wicklow Mountains about an hour outside of Dublin, the rental includes a full house staff to provide breakfast and cleaning each day. If you don’t need a whole castle to yourself, you can still secure top-of-the-line service and luxurious lodging. Ashford Castle in County Mayo was host to Pierce Brosnan’s wedding, and Dromoland Castle in County Clare was the site of the 2004 European Union-U.S. summit. Each is a five-star property located in the western part of Ireland, and are among the finest hotels in the country, surrounded by the lush banks of rolling hills and lakes where John Wayne’s "The Quiet Man" was filmed. Both castles offer everything visitors should expect from luxury hotels, from fine dining and exquisitely appointed guest rooms to expansive golf courses and a variety of special activities such as falconry. Castle stays aren’t just for well-heeled travelers; there are plenty of more economical options available. At Belleek Castle, in County Mayo, you can book single rooms from just $118 a night, and double rooms from only $183 a night. The 15th-century stone building offers stately rooms, and the castle is situated on 1,000 acres of forests, rivers, trails, and bridges. Hearty meals are served in the elegant wood-appointed dining room behind enormous heavy doors. The castle museum can be booked for private tours where visitors can view everything from fossils to 16th-century armor. Some castles even claim to be haunted. 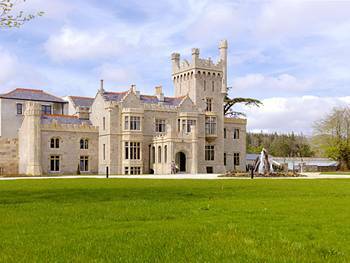 The Leslie family, in County Monaghan, has owned Castle Leslie for generations. On more than one occasion, deceased members of the Leslie clan have been known to pay the castle a visit. And Leap Castle, in County Offaly, is billed as the most haunted castle in Ireland. Sean Ryan and his family live at Leap Castle, and he says that they are often treated to ghostly experiences, and they offer tours to visitors. Ryan and his family often hear footsteps and doors creaking, and one of the resident ghosts likes to poke people. But, says Ryan, they’ve "never felt threatened by any of it at all. It’s all quiet friendly." No matter which castle experience you choose, every one of them gives visitors the opportunity to feast their eyes and senses on the lovely Irish scenery, and every one offers travelers a warm welcome. "The actual experience of somebody coming to stay in an Irish castle is not just the bed and the view and everything else," says Colclough. "It's the local people, and that really is what makes the holiday memorable."